NJ Fire Convention Sept 2008..who's going? Billy Bingo retired from the FDNY with over 20 years on the job. Since retiring he is now doing Stand Up Comedy full time and there's no turning back. Billy became hooked on performing whether it was cracking jokes at the kitchen table at his firehouse located in Jamaica Queens or on stage at the world famous Caroline’s on Broadway. Billy Bingo has performed at hundreds of firefhouses and fundraisers across the country. His stand up performance is based on being a NYC Firefighter as well as what goes on in his life at home. 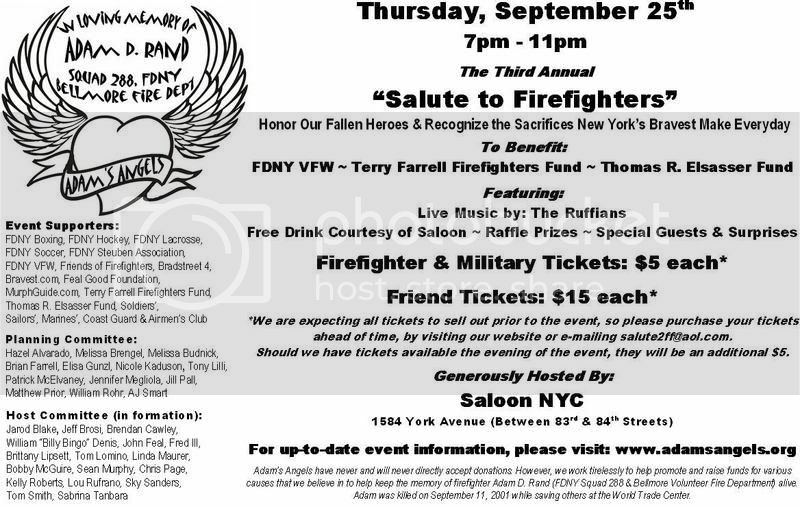 If you're firehouse wants to hold a fundraiser or comedy night just drop an e-mail and I'll get right back to you. you never know what to expect when the doors open and you roll on a call! Hello, as the founder of the 9/11 Patch Project (originally the National Firefighters 9/11 Memorial Patch) I have recently updated the website and released the 10 Year 9/11 Anniversary Patches. This project has run for over 7 years and involves 5000 fire, ems, police and military org's around the world. Would love to have each of your departments on board. Billy, Your comedy skit is funny as hell brother!! In December i am going to visit ny city for a week , so i was asking myself if there is a possibility to visit your firehouse? Billy, not really sure how to use this site, but I put the event up on the calendar here... so, tell your friends. All CT Firefighters and First Responder are admitted FREE! Come out and see the funniest comics to ever put on a turnout coat! Thanks for the add brother, Right on with the comedy. I got balls enough to run into fire but i couldn't get on stage!!! !Hang in there.